In a plate mix together the salts and the pepper. Rub the rim of your glass with lime juice then dip in the salt/pepper mixture and place glass in the freezer to chill. Combine the beer, lime juice, soy or Maggi sauce, Chipotle sauce and Worcestershire sauce in the bottom of your glass, fill glass with ice then slowly add your chilled beer. Give the mixture a couple of stirs and garnish with the slice of lime and some fun veggies to munch on. This goes great with my Four Cheese Quesadillas with Fresh Pico de Gallo! This is also known as a Beer Bloody Mary and I have added my requisite Bloody Mary accents. 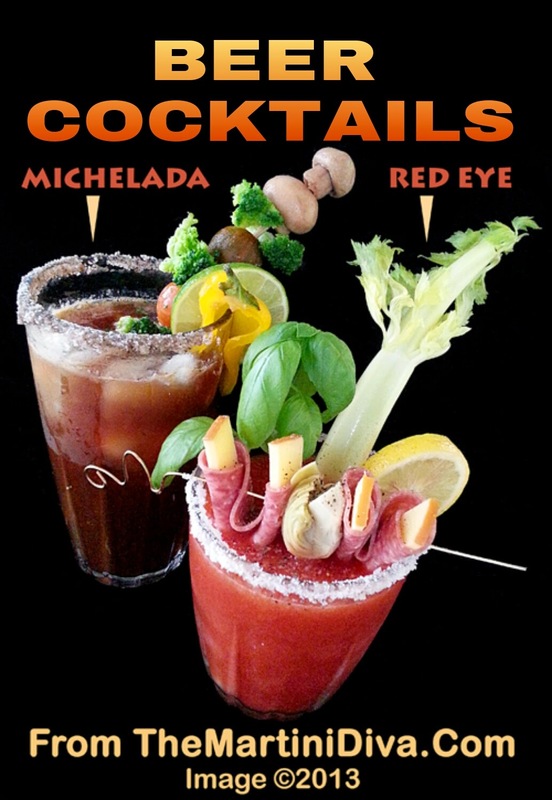 In the traditional Red Eye you simply mix tomato juice with beer and add a raw egg....but that was before all the egg worries of today. I also like to add a splash of vodka - what can I say? Rim your glass with some lemon then dip into the kosher salt. Chill your glass. Add the Worcestershire, lemon juice, Tabasco, Celery Salt to your glass, fill half way with ice, pour on the vodka (if you're adding it) then slowly add the beer. Give the whole kit and caboodle a good stir then grind on your pepper and garnish with the celery stick, lemon slice and some fun munchies on a stick - here I used smoked Gouda wrapped in salami and a nice marinated artichoke heart. This goes really nicely with my Cheese Crisps (Frico)!